Great Wolf Lodge’s signature winter celebrations with Snowland will begin again on Saturday, November 25, 2017! We LOVE Great Wolf Lodge!! 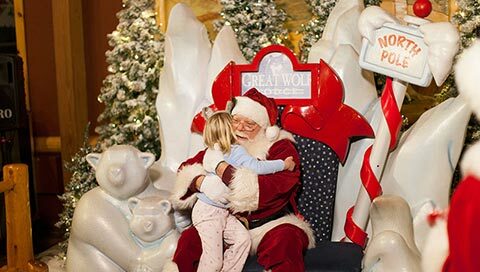 I am so excited that there is another festive season celebrated at Great Wolf Lodge in So Cal. I have to say that this is one of my kids most favorite places to be, swim, stay, play, everything... ever. Great Wolf Lodge is really a one stop shop for indoor, outdoor, year-round family entertainment with everyone's favorites... water play and attractions. Go ahead and create your own family traditions this holiday season with uninterrupted time together under the enchanting spell of Snowland’s twinkling lights, holiday trees and indoor snow showers that melt into perfect 84-degree basking weather in our water park. Make the holiday season even more memorable when you book a Snowland decorated Family Suite. Open the door to your personal winter wonderland in a room adorned in twinkling lights, glimmering garlands and a fully decorated holiday tree. You’ll also receive a free copy of our winter story book, "Unique as a Snowflake." Make the end of your day super sweet with a surprise milk and cookies delivery by one of our Great Wolf Kids characters! Each lodge has a limited number of Snowland Suites available, so book yours today! Our culinary team spends weeks cooking up and creating the beauty of our life-size gingerbread houses you and your pack can dine inside. Each delectable masterpiece welcomes you with incredibly detailed gingerbread walls, candy trim and heaps of white icing snow. When you dine in, your fee goes to the Ronald McDonald House Charities®! Santa Claus makes a pretty awesome grand entry on Saturday, November 25, at our annual Tree Lighting Ceremony, and he visits regularly throughout the holidays. Make sure Santa receives your children’s letters on time by mailing them at Santa’s Letter Depot in the lodge. North Pole University is enrolling now for the winter 2017-2018 snow-mester. Your children will delight in completing our holiday-themed activities and receiving their official “Snowploma” and a limited edition Rowdy the Reindeer trading card you can only get during Snowland! Hot Off The Press - There will be a special visit from the Coca-Cola Caravan Christmas Truck from December 13th to 18th! WOW! Snowland is looking to be a sweet treat to the Holidays! Get your winter fun planning now, the kids are out of school soon, I am always looking to fill the days with family fun! Water park passes included in your suite price – with access from 1 p.m. on the date of arrival until close on the day of departure.